As I mentioned last week, on Sunday we launched a new initiative at Calvary: the RACK campaign—Random Acts of Christmas Kindness. The idea is to share the Christmas spirit throughout the month by performing random acts of kindness for others—strangers, neighbors, family members, friends. Little did I know that I would experience an immediate impact from the RACK initiative. 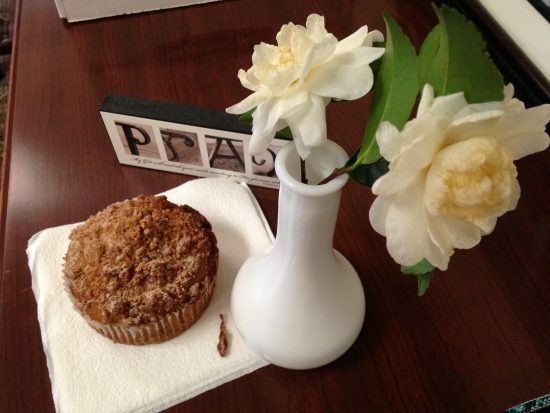 On Monday I was “rack’d” with a chocolate pie from the Pie Gourmet in Vienna and on Tuesday a special cinnamon muffin appeared on my desk along with white flowers! I should have started RACK years ago! Okay, seriously now….these two unexpected experiences reminded me of the power of kindness. I was truly delighted by these surprises and not even primarily because I love chocolate pie and muffins. I was delighted that someone would think of me and act on it. I felt connected and enfolded in community by these thoughtful acts, and that, in turn, stirred within me a feeling of gratitude and the desire to enfold others in the community I experienced. Simply put, kindness begets kindness. When we are kind, it inspires others to also be kind. Like throwing a pebble in a pond, we have no idea how far our random acts of kindness will ripple. I am finding that because the RACK acronym is simple and easy to remember, I am thinking more about how I can be kind as I go throughout my day—driving to and from work, standing in line at the bank, interacting with the young man at Home Depot as we bought a new snow shovel. I am thinking more about the impact of kindness on those I live and work with, as well as complete strangers. Kindness, it seems, is a virtue that has fallen on hard times. Part of that stems from an almost epidemic level of self-absorption: we are busy, in a hurry, and distracted, with our noses buried in our phones, not really engaged in the present moment or with the people right in front of us. And, part of it seems to stem from an absurd belief that kindness is a display of weakness. How ironic that the truth is the exact opposite. Kindness is compassionate strength in action, and we need more of that every day—much, much more. The Incarnation is one of God’s great acts of compassionate strength in action. In choosing to take on flesh and walk around with us for a bit, Jesus shows us what it means to be fully human, and it turns out that love and kindness are central to our humanity. The happiest, most contented people I know are people whose lives are more focused on others than on themselves. They are generous with their time and gifts and resources to help others learn and thrive. They enjoy and indeed, actively look for, opportunities to be a blessing to others. Generosity of spirit and kindness are hallmarks of a life well lived, because they are expressions of the love of God. There is no better time than Advent to be intentional about sharing God’s love with others through Random Acts of Christmas Kindness. And don’t forget to share your experiences with us either here or on our Facebook page! 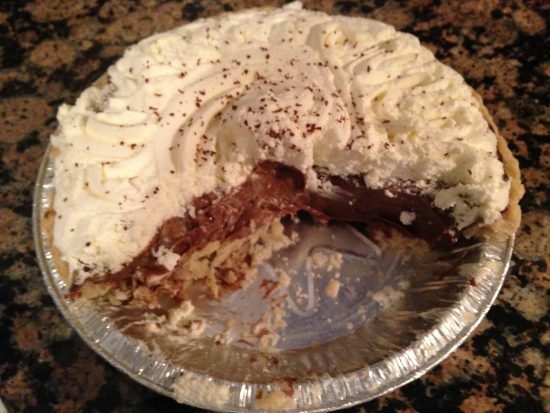 As for me, I have some extra gym time to do this week—but the muffin and chocolate pie are totally worth it!